A few days ago we shared some macro shots of spiders being reflected in drops of dew which were simply stunning. They definitely inspired me to pull out my extension tubes and reverse ring and get back into macro. If they inspired you to dabble, too, macro photography master, Thomas Shahan, just posted a new tutorial on the subject. There’s a lot of good advice for beginners in there, but more experienced photographers can find a few gems in the clip as well. The video is an mostly an eight minute long slideshow of Shahan’s brilliant macro photos with some behind the scenes shots in there for good measure. Shahan narrates the clip by explaining his setup, process, and dishes out a ton of great pointers for levels of photographers. Be sure to look for the variety of DIY light modifiers he uses in some of the images. He briefly talks about how he made one of them with a paper towel and some sheets of plastic. He’s able to get some great shots using just that and the pop up flash on his Pentax DSLR. Shahan using his DIY light modifier with a pop up flash. 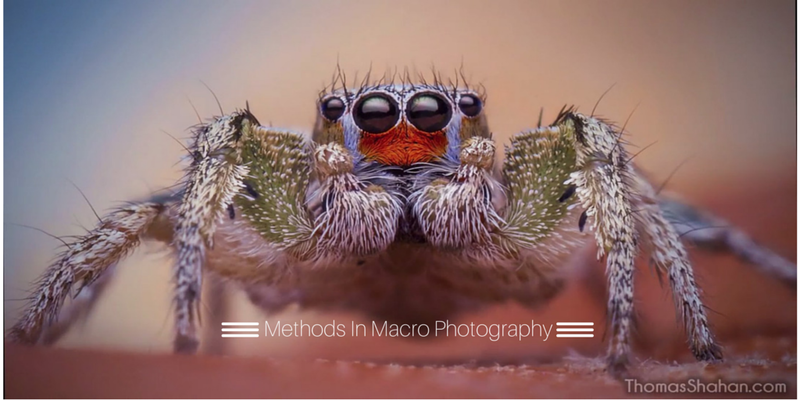 Take a look at the video below, then grab your macro setup and get some practice in over the weekend! Get his name right people! It is nice to know there are more uses for old manual lenses, and traveling into the field so lightly can produce such nice results. I imagine he was using the classic Pentax M 1:1.7, which costs under $50. Hello, I’m not very good in English, so, is there someone can tell me what lens does he used ?